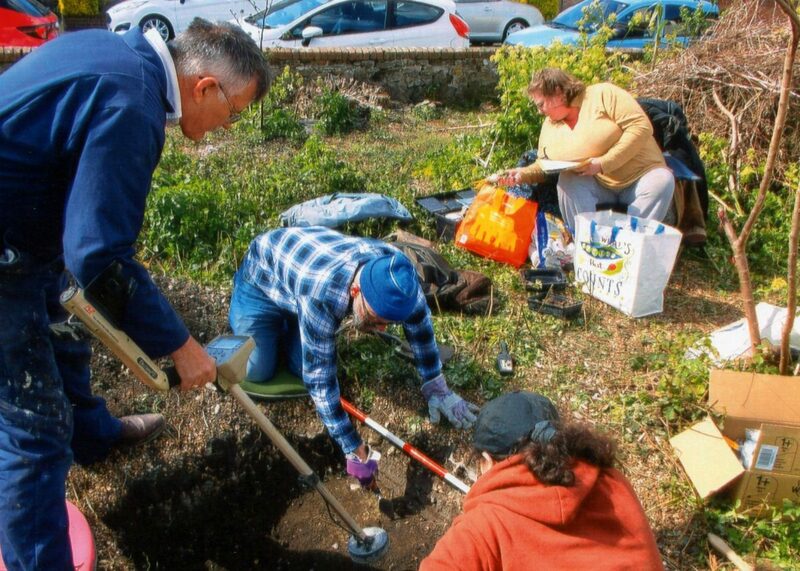 We’re pleased to announce that we have successfully re-booked the Folkestone Research and Archaeology Group to carry out more digging in the Triangle. Over the Easter weekend, Triangle volunteers and members of the Folkestone Research and Archaeology Group (FRAG) descended on the Triangle. Their mission: to uncover any history hiding below the surface. The ‘finds’ across that weekend included interesting pottery and glass fragments as well as chunks of ironwork and builders rubble. Volunteers on the day enjoyed washing the various finds before members of FRAG bagged them up and took them off site for further investigation. Following the success of this event, we have been able to book FRAG for a return visit on Saturday June 17th and Sunday June 18th. Please join us if you are able! On Sunday June 11th, we will need a small team to weed and tidy up the site – please let us know by email (hythetriangle@gmail.com), or by commenting below, if you are able to attend either event. The picture accompanying this article is reproduced with kind permission of Ray Duff. You can read Ray’s excellent piece about the first dig here. Our thanks to Alan Joyce and David Paton, form Hythe Civic Society, for introducing us to FRAG. A former animal pound, built in the nineteenth century to house stray livestock, the Triangle is a Grade II listed open space in Hythe, Kent. We will launch our full website in 2017 but in the mean time, we will try to keep our blog up to date. The Triangle land is owned by Hythe Triangle Community Garden, a Registered Charity No. 1163141. You can view more information about our governance at the Charity Commission website, here.